The third fire in six weeks rattled the Tesla community somewhat but it appears that the recent incidents are the result of bad luck and not of faulty equipment or a weak spot in the design. 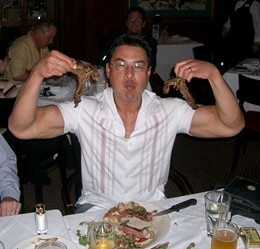 Juris Shibayama is a modern-day Renaissance man, whose talents range from orthopaedic surgery to bodybuilding to the inhalation of hamburgers. The last of these skills has earned him rising-star status on the competitive eating circuit, where he’s currently ranked twelfth in the world (just below the great Patrick “Bib Sheet” Vandam).